Two weekends ago I embarked on a trail running weekend getaway in Devon with LFTC. Having never done any off-road running prior to this, I didn’t know what to expect. They say not having expectations is the only way to avoid disappointment – well I can tell you one thing: I was not disappointed. I had been looking at the weather forecast every day the week before praying for a last-minute change. There was nothing any of us could do; it was rain, rain and more rain. 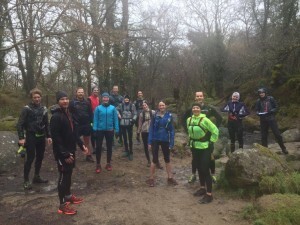 The first day was a 15km run in Dartmoor National Park. I have no doubt it’s a beautiful place, but that day it was so cloudy and foggy we could barely see our surroundings. We started in heavy rain and in less than ten minutes our feet were already soaked. I had a windproof cycling jacket which I thought was water-resistant, but quickly discovered it was not… It wasn’t long before I was wet from head to toe and absolutely freeeeezing. We had been advised to invest in a good pair of trail running shoes, with a sturdier sole and tyre-like grips. As a minimalist on a budget, I didn’t want to buy another pair of shoes only for a weekend, so I took my hiking shoes (having tried them on a few long runs) and was relieved to find they did the job just as well. After a kilometre or so, we split into two groups based on how far we wanted to run. As it was the first day and I was feeling in great shape, I chose the longer run. So off we went, around ten of us plus our two great guides. 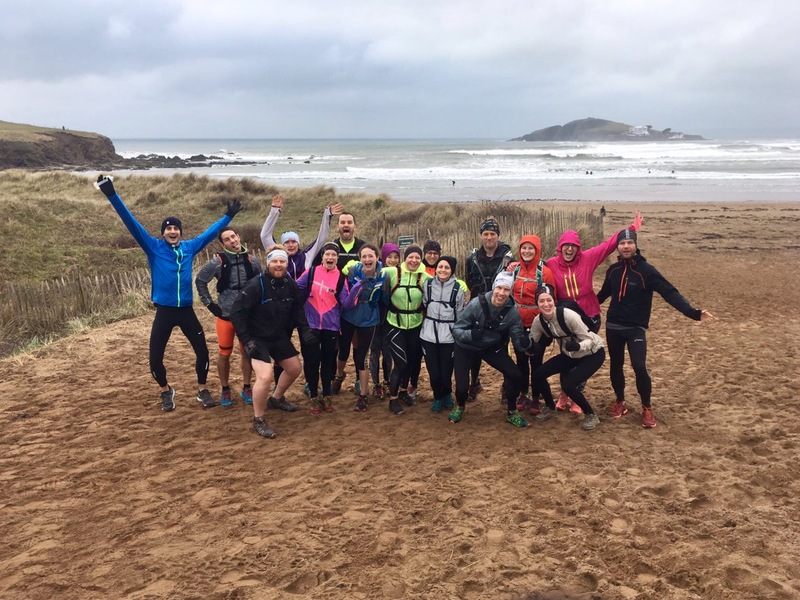 The terrain was extremely varied; grass, soil, rocks, pebbles and sand, not to mention the endless mud baths and puddles! At the beginning everyone was quite cautious about avoiding these but we soon accepted this was futile and so started running through everything in the way. 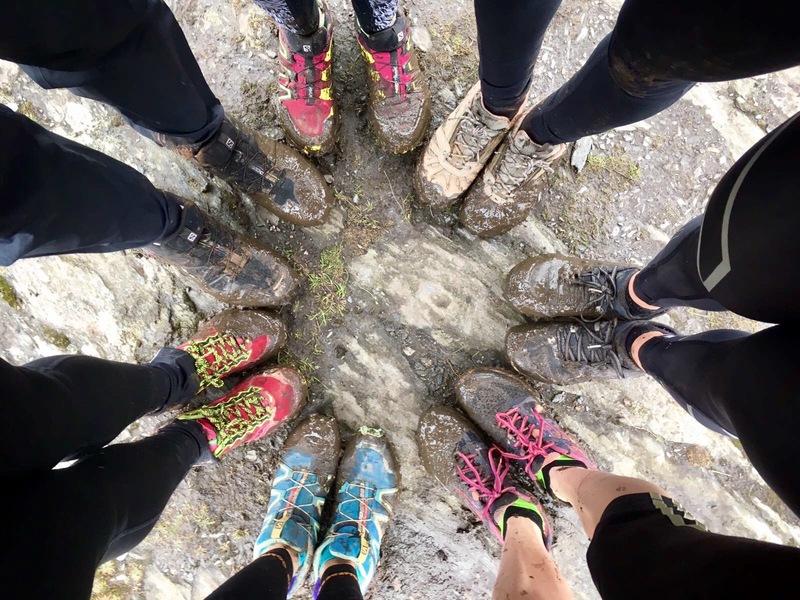 Constantly jumping and leaping across puddles is said to take tremendous effort, so experienced trail runners actually avoid doing this in order to maintain their energy, especially during races. After about an hour, we stopped to take a break. The wind was so strong I was crouching by a rock to protect myself. The energy of the group was still high and chirpy but I was getting colder. The rain had completely soaked my jacket and my under layers. I had to push myself mentally, “come on, you can do this. You’ve already done more than a third now”. To distract myself from the physical discomfort, I started to look around and enjoy the beauty of the wilderness. If it was this stunning on a cold and cloudy day, I can’t even imagine what it must look like when it’s clear and sunny! Next thing I knew, we had arrived at our destination, gastro-pub! Of course, the sun started shining the moment we had finished…typical. We converted our rental bus into a changing room (ladies first, of course) and stripped ourselves of our wet and muddy gear and into dry and clean clothes. We then celebrated having survived the first day by stuffing ourselves with food and cider. I’m not normally a big fan of pubs, but that day it felt like total paradise. Our second day was a 17 km run along the coast, from Bantham Beach to Salcombe. The scenery was truly breath-taking. 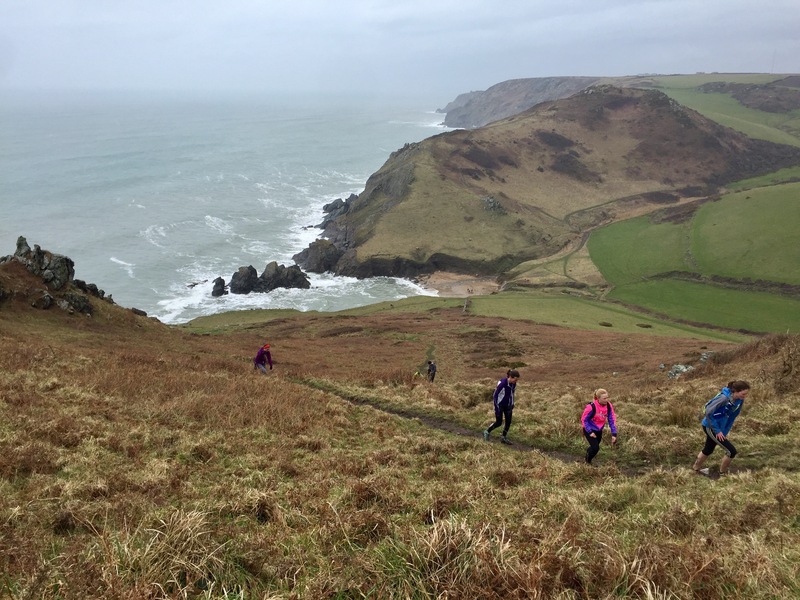 Most of the time we were running along cliffs, with fields or villages on one side and the ocean on the other and the weather was much better, we were all prepared to get wet again but thankfully it only started raining towards the end. The group naturally separated into three groups, an easy short run, easy long run and a fast long run. While the first day we were constantly stopping to wait for each other, the second day I was glad to find myself in a group with the same pace, so there was no rushing nor waiting, everything just clicked. 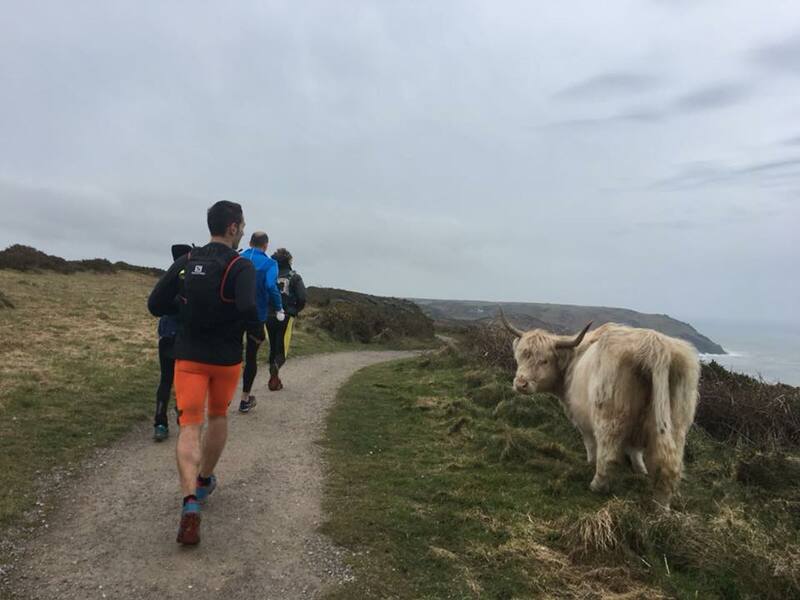 Trail running is very different to road running. As a Londoner, I only really run on paved, flat ground which requires little technique. Trail running is much more technical, I thought I few track sessions and long runs would have prepared me for the weekend, but I did miss a crucial training element…hills. As we were in Devon, there was very little flat ground and I started feeling it in my quads (muscles just above the knees) after the first day, by the end of the second day, I was so sore I could barely walk1 It took me two more days before I could start walking normally again, but the ache was worth it! The other major difference is the pace, being much slower than road running and doesn’t require as much effort fitness-wise, except of course when climbing hills… While a 15km run would normally take me 1.5 hours in London, we covered the same distance in 2.5 hours. I had never run for more than two consecutive hours (and certainly not two consecutive days! ), which is probably another reason my legs got so sore. But at a much more leisurely pace, it meant that I could enjoy the surroundings and company on the runs which I don’t get to do when I’m running on my own in London. 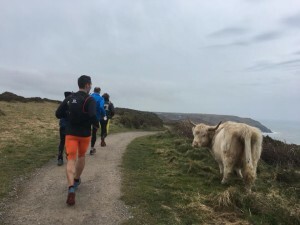 What did I learn from my wild running weekend? One, that Devon is a ridiculously beautiful place. Two, that I really enjoy trail running. What will I do differently for next time? First on my to-do list: buy a waterproof jacket! Then, do a lot of hills training beforehand as well as longer runs (for time, not distance). Now, where do I sign up for the next one please?